Home Anime Jojo’s Bizarre Adventure Part 5: Golden Wind is coming soon! Jojo’s Bizarre Adventure Part 5: Golden Wind is coming soon! Every Jojo fans goes WRRYY!! JoJo’s Bizarre Adventure’s long awaited sequel is official! 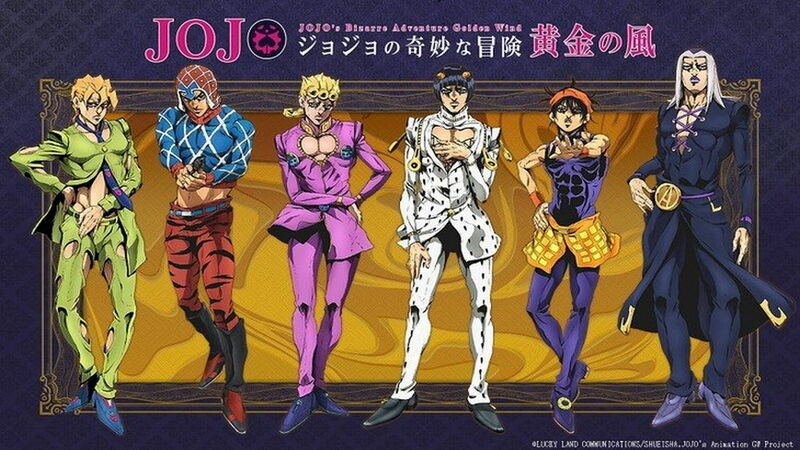 Series creator Hirohiko Araki recently announced that the manga’s fifth story arc is getting an anime, and it’s entitled Ougon no Kaze/Vento Aureo (Golden Wind). The announcement was made at the end of a Jojo art exhibition press conference. The first key visual of the anime the and it’s main characters were also revealed during the announcement. David Productions, the studio behind the first four JoJo installments, will return to produce the Golden Wind. JoJo’s Bizarre Adventure tells the tale of the Joestar family, who are destined to encounter supernatural/Bizzare foes with their unique powers, most notably their nemesis Dio. Vento Aureo (Golden Wind) revolves around Giorno Giovanna who aims to be a powerful “Gang-Star”. The series is well known for its crazy character designs, and of course, its villain’s expression. Jojo’s Bizarre Adventure: Golden Wind will air this fall 2018. Next articleHere’s a sneak peek of Zoids Wild Episode 1!